Rugby League Samoa has named a TOA SAMOA Under-Eighteen squad to play the NZ Resident Under-Eighteens, inaugural game between both nations in this age group. The game will be played at 12pm noon in Auckland, on Saturday 6th October at Bruce Pulman Park, Takanini. Coverage will be LIVE STREAMED. TOA U18s team will be coached by Geoff Morton (Northcote Tigers) and Alan Ettles (Richmond Rovers) both established with knowledge in the Pacific ranks. Geoff Morton said “It is exciting to see opportunities for these young men, to play in front of family and friends is huge for them”. Alan Ettles added “I am looking forward to working with players domestically and internationally, and that this fixture will create further international opportunities for Samoa at age group level and likewise the Premiers. The TOA SAMOA squad will assemble in Auckland on Monday 1st October for team preparation plus engage in community events to remind everyone involved in our code about the importance of service and responsibility to others away from the footy field. TOA SAMOA U18 team is comprised of players from Christchurch, Auckland, New South Wales, Queensland and Pacific excited to represent Samoa. TOA COACHES: GEOFF MORTON, ALAN ETTLES. TOA TRAINER: BEN COLLINS, MING MAFOE, CHRIS TAUTIAGA. TOA PHYSIO: ULIMA TOFI, QUENTIN HOKIANGA. TOA MANAGER: KYLA KAISER DAY. TOA TECHNICAL ADVISOR: FRANK SEFO FUIMAONO. 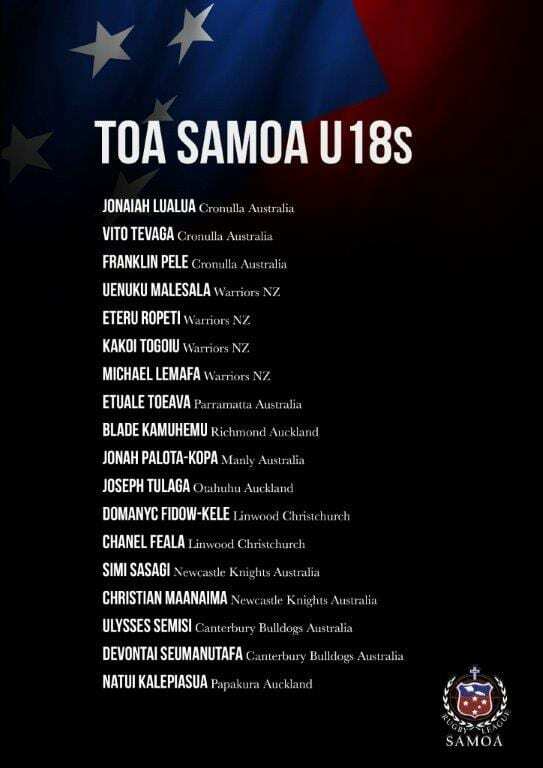 TOA RESIDENTS U16s team to face NZ U16s.